St Patrick’s Church, Kilquade is steeped in history. The name Kilquade (Cill Comhghaid) tells of a St. Comghaid who had a hermit’s cell or a church in the area. There was a Catholic community here in the 1600s. Two chalices still in use bear the inscription “Anno Domini 1633” and 24th November 1759”. Official records of 1701 list a Fr. Seneca Fitzwilliam as the incumbent priest recognized by the British Government under the Penal Laws. 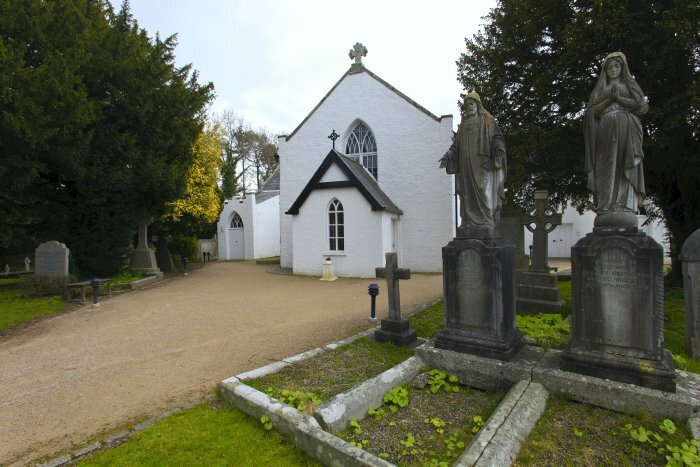 The ancient Church of St Comgall in Kilcoole was the original parish church, but sometime during the 1600s or 1700s the parish centre passed to Kilquade. The original church on this site was burned during the 1798 Rebellion. Re-built in 1802, many of its original features, the old stone floor, the windows above the Sanctuary were restored. Part of the funding for the new building was in the form of a “Restoration Grant” of £ 77 which came from the British Government. Consequently, St Patrick’s Church is known as a Compensation Church” and is the only such church remaining in the Dublin Diocese. The mass path leading from Kilcoole passes the church, as does another mass path leading to Kilpedder.